For a real taste of an Arctic winter, try visiting Greenland between November and February, where you’ll be treated to a possible display of the spectacular northern lights, along with a dark winter sky and cold, clear Arctic air. If it’s snow you want, Greenland is a good bet, as there’s usually rather a lot of it over the winter. You can take dog sled and snow mobile tours in winter, often in the darkness and illuminated by moonlight and the glow of the stars reflected back at you in the snow. The best months for dogsled driving are from February to April. The number of days of winter darkness will depend on where exactly you stay in Greenland. The most northerly town, Qaanaaq boasts the highest number of days of winter darkness – but it’s not completely black as the amazing reflections of moonlight in the snow and the eerie glow of the Northern Lights light up the landscape when the sun is out of view. The Greenlandic ice sheet is a massive ice cap that you can fly over, sail across, drive over and even walk to the fringe of, if you’re brave. In some places you can actually walk on the ice cap, which is a monument from the last ice age. Try your luck ice cap walking at Kangerlussuaq. If you are into extreme sports and just trying new things, some tours give you an opportunity to chance to cross the ice sheet. You’ll need to get special permission and you’ll need to be up to the challenge – only a few travel companies offer the experience as it’s a dangerous one. Some of Greenland’s icebergs rise from the ocean to the height of a 15-storey building, but others are tiny. You can see them in all of the waters of Greenland, but the best places to spot an iceberg are to be found around Ilulissat and Uummannaq where many large icebergs break away from the glaciers in the deep fjords. Kangerlussuaq is another good place to visit in winter, as the climate promises cold clear winter days – just what you need for going on a fabulous, exhilarating dogsled trip. With around 300 days a year of clear skies, Kangerlussuaq is also said to be one of the best places in the world for glimpsing the elusive northern lights. Lapland is a twilight country, where in the most northern corners the sun can refuse to rise properly last for up to 51 days. The winter season begins in mid-October and lasts up to 200 days. As a result, Lapland is fantastic for winter activities and places to see. If you can brave the temperatures of -45 to -50°C, and a constant snow cover that just gets thicker in Lapland right through to March, you can try your hand at cross-country and downhill skiing, or snowboarding. Other treats in store are husky sledding, snowmobiling, even a reindeer sleigh ride. Lapland has two recreational areas: Arctic Circle and Inari. The Arctic Circle Hiking Area is easily accessible by coach and there’s a good network of trails and rest spots, as well as the river Raudanjoki where you try out some of the water activities on offer. If you fancy fishing at Vikaköngäs, you can even get a fishing licence by mobile phone. 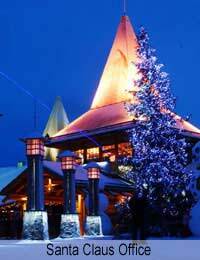 Santa Claus Village is in the Town of Rovaniemi right on the Arctic Circle. You can follow a trail that takes you to Santa Claus’ Office, where you can meet Santa and see the elves working at the Main Post Office. You can catch a demonstration of snow building at The Kemi SnowCastle – the attraction changes every year. There are lots of events at the castle, as well as the Snow Restaurant, Hotel and Chapel. If you want to find out more about the Lappish culture, Arktikum is the place to explore. Arktikum has exhibitions that give you a bit of an insight into the way the world’s northern-most regions have lived - from prehistoric times until now, and even looking to the future. Arktikum is in the town centre of Rovaniemi, on the shores of the Ounasjoki River. Lapland and Greenland are undoubtedly cold and in places hard-going. But for a perfect winter break, you can’t get much more wintry!